I last wrote about the aftermath of the June 2016 Brexit vote in this blog – Mayday! Mayday! The skies were meant to fall in … what happened?. Admittedly, it was written just a month after the vote and so the analysis could legitimately be considered as being tentative and was designed to refute the claims by the remainers that the UK would instantly sink into recession. It didn’t and it hasn’t. Despite the tentative nature of the blog (using the first data releases after the vote), I received a bevy of ‘hate’ E-mails, presumably from those ‘darlings’ that were miffed they didn’t get their way in the vote. Bad luck, that is the way ‘democracy’ works. We are now at the end of June and we have more information and my conclusion in August is now more concrete. The doom and gloom that was meant to follow the vote outcome is not to be seen in the data. While we might dismiss the on-going strength of consumption expenditure as being short-termism (it might change quite rapidly), last week (November 25, 2016) we learned that private capital formation (investment) is growing strongly and a number of foreign companies have reaffirmed their commitment to on-going investment in the UK. That is forward-looking decision making – out years into the future. Doesn’t look like a Brexit calamity to me. Remember when the IMF was predicting recession for Britain? Prior to the Brexit vote, the IMF which was working hard to keep the elite neo-liberal establishment in place (Britain under the yoke of the European Commission) claimed that Britain would enter recession if it voted to leave the European Union. On June 17, 2016, it published the annual – United Kingdom : 2016 Article IV Consultation-Press Release; and Staff Report. On balance, the net economic costs of an exit are likely negative and substantial … the level of output is … 51⁄2 percent below the baseline in a more adverse scenario. Inflation was also forecast to accelerate although, curiously, Madame Lagarde had claimed in early May 2016 that a vote to leave the EU would lead to a “steep fall in house prices” (Source). On July 19, 2016, its released its latest World Economic Outlook Update – IMF Cuts Global Growth Forecasts on Brexit, Warns of Risks to Outlook – and predicted the “economies of the United Kingdom … and Europe will be hit the hardest by fallout from the June 23 referendum”. The U.K. economy will expand 1.7 percent this year, the IMF said, 0.2 percentage point less than forecast in April. Next year, the nation’s growth will slow to 1.3 percent, down 0.9 point from the April estimate and the biggest reduction among advanced economies. On November 25, 2016, the OECD released its – Global Economic Outlook, November 2016 – and projected that the UK would grow by 2 per cent this year (2016) then slow to 1.2 per cent in 2017 and 1 per cent in 2018 as a result of the Brexit outcome. The OECD is always wrong so we can safely ignore any warnings they provide. The fact is that the data is telling a very different story. 1. Last week (November 25, 2015) Jaguar Land Rover announced that the company planned to increase its production output by 100 per cent to 1 millions cars by 2020. Relatedly, the car manufacturer “said that designing and engineering its vehicles in the UK is a vital part of the company’s heritage” and that it “wanted to make Britain a global centre for battery research and development to power electric vehicles.” (Source). 2. The troubled Tata Steel UK operation has apparently sold off its Specialty Steels business in South Yorkshire to a London-based group (Liberty House). The company also said it was working to “to develop a more sustainable business in Britain” (Source). Liberty has been buying up other Tata Steel assets elsewhere in the UK. 3. The big three IT companies Apple, Facebook and Google have all announced major investments in the UK. Facebook will invest in a new “a major London headquarters” at Fitzrovia, while Google “plans to build a new campus at King’s Cross”. Meanwhile Apple “s moving into Battersea Power Station‎, helping to generate new jobs and economic prosperity for Londoners” (Source). As the Chancellor indicated these decisions represent “a clear signal that companies are continuing to invest in Britain’s future”. It doesn’t look like Brexit gloom and doom to me. The British Office of National Statistics released the latest retail sales data on November 17, 2016. The retail sales data measures first-hand how strong consumer spending is – it is immediate and doesn’t lie. The result for October was “the highest rate of growth since April 2002”. In October 2016, the quantity of goods bought (volume) in the retail industry was estimated to have increased by 7.4% compared with October 2015; all store types showed growth with the largest contribution coming from non-store retailing. This is the highest rate of growth since April 2002. The underlying pattern in the retail industry continues to show strong growth with the 3 month on 3 month movement in the quantity bought increasing by 1.9%; this is the 34th consecutive period of 3 month on 3 month growth. The following graph shows the annualised growth (red bars) and monthly growth (blue line) in retail volumes since January 2008 to October 2016. The data suggests that there is some genuine confidence among consumers in the UK. All those post-referendum stories of voter regret and gloom do not seem to be showing up in the data yet. But it is clear that retail sales data can fluctuate and there so it is not impossible that there might be a plunge in confidence any day now! So lets look at the latest National Accounts for more clues. Last week (November 25, 2016), the British ONS released its – Second estimate of GDP: Quarter 3 (July to Sept) 2016 – which covers economic activity in the three months after the Brexit vote. 1. Real GDP growth in the third-quarter 2016 was 0.5 per cent. The ONS said “This suggests limited effect so far from the referendum.”. 2. The annual growth rate was 2.3 per cent well above the IMF and OECD predictions for 2016. It would take a major collapse in spending for real GDP growth to come close to the IMF prediction. The claim that the Brexit vote would generate a recession seems highly unlikely and was just ideological banter. 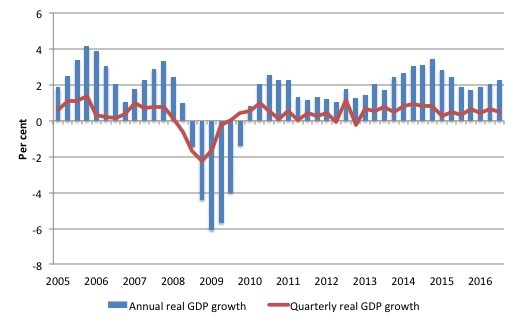 The following graph shows real GDP growth – annual (blue bars) and quarterly (red line) from the March-quarter 2005 to the September-quarter 2016. The annual real GDP growth has picked up pace in recent quarters. As an aside, I find all this talk about how Russia is meant to have undermined Hillary Clinton’s electoral chances and interfered with democracy rather amusing, especially when you consider the weight that was brought to bear by the UK government on the Brexit referendum in the guise of constant IMF and OECD claims that the sky would fall in. 3. Household expenditure grew by 0.7 per cent in the third-quarter 2016 and 2.6 per cent for the year to September. That rate of growth has been fairly constant since the beginning of 2015 (varying from quarter to quarter but fairly robust). So no signs that households are changing behaviour, even in the face of higher imported prices via the depreciation in the pound. 4. Most significantly, Gross fixed capital expenditure grew by 1.1 per cent in the third-quarter 2016 and 1.2 per cent for the year to September. This expenditure reflects forward-looking expectations of future growth in sales. Unless, the firms making these investment outlays are totally misguided, their commitment to building productive infrastructure within the UK suggests they have not been spooked by the Brexit decision. I do not really remember too many forecasts of the IMF saying they thought it was going to be a soft landing for the UK after a no vote. In fact, there were quite little warnings about how terrible life would be. There would be falling house prices, falling share prices. The economy would go into recession with knock‑on impacts on to the rest of Europe. Maybe I missed the caveat, but most of the IMF message seemed to be very negative about the short term for the UK. So, my question is this: If you got it wrong about the short term, why should we trust you about the longer‑term impacts? … we are happy about the outcome. It is our job to warn against the risks. He had earlier claimed that “There is some evidence of deferred investments in the UK economy that will have an impact in that year” (2017). So, as always with the likes of the IMF, it is a moving feast. If they are advocating austerity, they always predict the most benign outcome (usually that the economy in question will grow regardless) and if they are talking about some progressive development (such as a discretionary rise in the fiscal deficit or in this case the vote to leave the dysfunctional European Union), they predict the worst. Then when these ideological biases show up as systematic predictive failures they mince their words and modify their predictions. Sometimes they admit they got it categorically wrong – as in the October 2012 admission about Greece. No executive in the IMF ever seems to lose their jobs given this incompetence. They just blithely sail on with their super high salaries, swanning around the world creating havoc. I hope Donald Trump withdraws US funds for the IMF, which would see it collapse. I expect more indignant E-mails from UK citizens – mostly of an alleged progressive persuasion who are still amazed the hoy polloi in Britain had the audacity to resist their wise counsel and vote to leave. Of course, the situation could turn for the worse. But so far all the predictions that were made by the remainers and their squawk squad including the IMF and the OECD have not turned out to be remotely true. I am also not suggesting that Britain is a modern day nirvana. Far from it. It is ruled by an incompetent conservative swill and the Opposition Labour Party doesn’t know what day it is (in macroeconomic terms). But still, the June vote has not derailed the economy (so far) and with investment spending strong, it is not likely that a recession is in the wind. Yes, the government could get stupid and impose harsh austerity and drive the economy into the ground. But the Autumn Statement last week didn’t suggest to me that it was going down the George Osborne (2010 version) route. Well that gave me the biggest laugh of the day, if not the month. Sad but true. And those in grief won’t listen. Even when you show that the UK Terms of Trade are actually improving on the data they are convinced a ‘Sterling crisis’ has to happen. As far as I can see, the Tory government seem to be spending about £17bn extra in nominal terms from April 2017, which is about £9bn in real terms. That’s just a back-of-envelope guess from their announcements in the Autumn Statement. Also the OBR I think are underestimating inflation next year, as producer price inflation looks very high to me, and must be passed on to a higher extent. As a result it looks to me that the government are still not providing enough fiscal support, given the high household deficit (2%). I think there will be about half the growth in 2017/18 of the previous year (About 1%). The government needs more up-front stimulus in April IMO to ensure wage growth is closer to the higher inflation rate next year – perhaps another £10bn. We know that wage-price spirals are unlikely with worker rights so undermined, and government can therefore provide more stimulus, and restore some worker rights too. Just to be pedantic, why did you put a hyphen between “ideologically” and “based”? I notice that more and more, that people put a hyphen between an adverb and an adjective or participle. I don’t see the logic of it. If you had written “ideology-based”, then the hyphen would have been appropriate. I noticed a recent Simon Wren-Lewis piece pointing out that a monetary sovereign cannot go broke irrespective the amount of debt. He wrote: “So for economies that issue debt in currency they can create, there is no obvious upper limit anywhere near to current debt/GDP ratios when economies are depressed and inflation is low. Japan shows us that, and we must stop treating Japan as some special case that has no lessons for the rest of us. (How often did we hear of their lost decade in the 1990s that it couldn’t happen anywhere else. )” But he still refused to point out that a monetary sovereign need not issue any debt to fund its activities. So close to reality, but he refuses to state the obvious. As I said to another commenter under a previous article, although the UK Chancellor, Hammond has pulled back from the Osborne commitment (futile though it was) of balancing the budget in the foreseeable future, there is still not commitment for real public investment of the kind that those of us on what I hope is the real progressive wing of politics & economics would like to see. The NHS is still starved of the funds it needs (and of course is being privatised, and not all that stealthily), hideously expensive & complex “Private Finance Initiative” deals are still in place, local government is starved of funds (but at the same time having extra duties imposed on it), infrastructure is still crumbling, students are still landed with impossible debt, and housing is still unaffordable. A truly expansionary government could do much more to ease the uncertainty overhanging the Brexit-negotiation period. Even the Tory Telegraph recently criticised Hammond for not being expansionary enough. Philip Hammond has succumbed to the fatal caution of the Treasury. A rare chance has been wasted. Britain must now face the full storm of the Brexit downturn next year and the year after without any precautionary buffer worth the name. A hard landing is all but guaranteed. If the Chancellor had wished to launch a barrage of investment on the country’s rickety infrastructure and do something to lift productivity from the bottom ranks of the OECD league, there could scarcely have been a better global climate. All the stars are aligned. The whole world is shifting on its economic axis. The era of fiscal austerity is over. The US, Japan, and even the eurozone, are all are switching to net stimulus, painfully aware that zero rates and quantitative easing have run their useful course. (Of course, I don’t agree that QE was “useful”, but it’s interesting that a Tory paper can comment in this way). 4) Local authorities unable to cope with social care which will result in ‘culling’. I suspect that the spending spluge Bill writes about must have come from the 30% of the populace of the UK who are asset rich and have fared well under financialisation. I cannot believe that the poorer part of the populace is increasing its debt in order to spend -but I might be wrong. aggregate private sector deficits as government sector deficits trail behind external deficits. the rich will exacerbate speculative bubbles and weak demand. Portugal may see Austerity ramped up. The risks to the Uk economy are real and if they hit Brexit will be blamed. Bill, there was nothing in the autumn statement about the NHS or social care provision. Hence, in this respect, not much different from GO. But some Tories are already up in arms about this. They could lose their seats. AND, Hammond, probably because on his own admission he doesn’t know what he is doing, is still backing balancing the books, which of course may constantly recede into the distant future. Even though this objective may recede, it may well affect the level of financial stimulus Hammond and/or the Treasury can cognitively live with. So far, not a great deal for the non-money-makers oka the poor or low-paid. He claimed this himself before the autumn statement and did not contradict himself. Which I suppose could be seen as a virtue in our Trumpian times. Just for the record, I’m a UK citizen, of a progressive persuasion, and I voted for the UK to leave the EU. As did everyone I know except one. And he immediately wished that he’d voted to leave too. The idea that ‘progressive’ equates to EU-allegiance is just one of those many tired old attempted take-overs of a word by a certain arrogant faction.